Stand out from the crowd at any fancy dress party with this gorgeous adult women's Super Trooper fancy dress Costume which is perfect for recreating that Abba look! Included is a Red Top with white bell sleeves, coordinating Trousers and Headband! Going as a pair? why not check out our Super Trooper Male fancy dress Costume. Great costume. I am a size 12 and it was a perfect fit but it is designed with plenty of leeway and stretch so it would fit anyone in the size range. Colours are bright and outfit is flattering. Fabric was a teensy bit scratchy along some of the seams but that's the price of fabulous-ness. 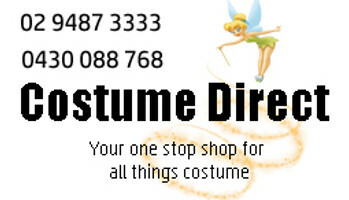 Costume Direct were amazing and I would definitely recommend them. This Abba costume is absolutely fantastic. It is well made and I was pleasantly surprised that it was better than the actual photo. I had a great time at the party and received lots of positive comments about it. It was packaged well and was delivered very quickly. Thankyou!